BelarusDigest > All > Is Lukashenka Preparing for a War? At the end of January, Belarus temporally mobilised nearly 15,000 reservists - a large number for the nearly 50,000-strong national army. At the end of January, Belarus temporally mobilised nearly 15,000 reservists – a large number for the nearly 50,000-strong national army. A major Russian news portal Gazeta.ru linked this move to the escalation of the Ukrainian conflict. At the same time, the Belarusian army began conducting military exercises. The Belarusian parliament also introduced several amendments to existing legislation – allegedly with the view of preventing "hybrid wars," like the one currently going on in Ukraine's eastern regions. These actions have generated rumours about the intentions of the Belarusian government which has to date sought to preserve its neutrality in the conflict between Russia and Ukraine. Belarus's neutral stance has provoked criticism from Kyiv and Moscow alike and it is becoming increasingly difficult to maintain. Not only is Belarus's economy suffering from the external effects of the conflict, but the Ukrainian war has caused political rifts inside Belarus as well. While the Crimean scenario is unlikely to play out in Belarus, the destabilisation of the country's internal politics and a rise in tensions on the border with Ukraine are highly probable. 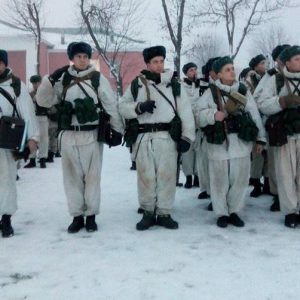 On 23 January the Belarusian army begun exercises at six different military training grounds. The Belarusian Defence Ministry said that the manoeuvres were motivated by an increased level of activity by NATO's forces near Belarus's borders. The nature of the exercises would seem to suggest another, more complex motivation. According to the Chief of the General Staff, major general Aleh Belakoneu, the army will conduct exercises to hone their own air force and air defence systems, as well as strengthen border security. While the focus on air defences may indeed stem from NATO's activities, beefing up security on the border betrays a different concern – namely, sealing Belarus's perimeter. The war in neighbouring Ukraine escalates, while Belarus-Ukrainian border remains porous. In these circumstances, it is extremely important to suppress illegal activities or infiltration of all kinds of force in both directions through the Belarus-Ukrainian border which can cause further destabilisation of the situation in Belarus or difficulties in relations with Kyiv. Minsk's concern over the developments in Ukraine may have also been the motivation behind changes to the the Law "On Martial Law" that entered into force on 1 February. The amendments stipulate that martial law can be imposed if another state sends "armed bands, irregular forces, or units of regular troops" to the country, regardless of whether war has been declared or not. Some opposition media, including Belorusskiy Partizan, view the amendments as Belarus's reaction to Kyiv losing Crimea. Dzyanis Melyantsou of the Belarusian Institute for Strategic Studies disagrees with this view and emphasises that the earlier versions of this law already discussed this type of threat. Yet some aspects of the amendments merit more consideration. For instance, the law stipulates that an act of aggression against one of the Collective Security Treaty Organisation (CSTO) member states (Russia, Kazakhstan, Tajikistan, Kyrgyzstan, or Armenia) is regarded an act of aggression against Belarus. Furthermore, the document contains new provisions on the use of physical force, weapons, special equipment and technical means by military personnel while enforcing martial law. According to Melyantsou's analysis, "soldiers and other individuals involved in enforcing martial law have the right to use force and weapons in virtually any situation, including against unarmed civilians.” These provisions suggest that the Belarusian government has learned a lesson from Ukraine. Moscow-based Nezavisimaya Gazeta reacted to Belarus's recent spurt of legislative activity by publishing an article titled “Lukashenka Goes to War.” The article argues that the recent legal innovations are aimed at preventing the “Crimean Scenario” and cites Lukashenka's criticism of the Ukrainian army for failing to defend the country. is doing exactly as much as necessary to not to spoil relations with Russia. Yet we shall not forget about his absolute dismissal of the uprising in Novorossiya. … Even Crimea […] he does not recognise as Russian, but simply proposes that Ukraine forget about it in order to avoid more grave consequences. The Ukrainian news agency Novyi Region struck a different tone by asking, “Are Belarusians Being Prepared for a War with Ukraine? There is no one else to fight.” Novyi Region justifies their position by referring to the “complete financial and political dependence of Lukashenka's regime on Moscow” and by Belarus's common border with Ukraine. At a meeting with journalists on 29 January, Lukashenka emphasised that Belarus was a sovereign and independent state. He said the country will never surrender its territory to anyone. The Belarusian Head of State also explained that in order to protect Belarus's sovereignty, the government is reforming the army, restructuring the defence industry and developing new weapons. We seek to provide Belarus with its own arms. Now our army is supplied primarily with the weapons produced in Russia. We are manufacturing some components for these weapons […] Yet we must have the proper weaponry so that any potential aggressor would not even imagine going to war with Belarus. Indeed, Belarus lacks modern military equipment. According to daily newspaper Vzglyad, Belarus received two batteries of S-300 surface-to-air missile systems for free because they “were not needed anymore” in Russia. The Russian army decommissioned the S-300s in order to integrate more modern weapons into its arsenal. This year, Belarus also gets nuts – five training Yak-130, spare parts for aircraft and helicopters, some complete helicopters, tank engines and other supplies. Minsk seems to have already given up on hopes of replacing the aircraft it inherited from the Soviet Union with modern fighters. To date the Belarusian government has been desperately trying to avoid getting entangled in the confrontation in Ukraine. The Ukrainian crisis has forced the Belarusian authorities to promptly adopt the logic of national interest and with unprecedented resoluteness challenge the Kremlin's policies. However, Belarus still remains vulnerable to destabilisation attempts. Last month Belarusian authorities continued their offensive against independent media. An amendment to the media law, in force since 1 January, tightened the state's control over the Internet. Eight days later, the state ordered the confiscation of profits from an independent publisher (Lohvinau). On 19 January the Ministry of Information used the tragic shooting at the French satirical newspaper Charlie Hebdo to warn its domestic media of the risks of free speech. And on 26 January the Supreme Court rejected an appeal by the independent newspaper Narodnaya Volya against the Ministry of Information’s warning. Information control has long been Minsk’s preferred approach to coping with economic problems and swaying public opinion ahead of elections. 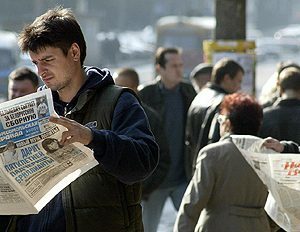 While independent newspapers can be easily purchased in the street and all websites are accessible from home computers most of the time, the state frequently harasses media outlets so they know “who the boss is." This time, however, its heavy-handed approach may inadvertently strengthen the influence of Russian media in Belarus. As a growing number of Belarusians seek information online, the Belarusian state has sought to limit dissent in the Internet. The amendments to the 2008 law on the Media that came into force on 1 January seeks to regulate the distribution of media products online. They also expand the state's power to block Internet resources. While previously only the propaganda of war, violence, cruelty, or extremism could be blocked, now any information that can harm Belarus’s "national interests" may trigger the shutting down of a website. Materials published as far back as three months can serve as grounds for blocking. As Andrei Bastunets, Deputy Head of the Belarusian Association of Journalists, notes in a 23 January article in Foreign Affairs, a broad interpretation of the law would put even foreign websites within the reach of state censors. Additionally, web hosts can now be held accountable for all comments posted on their websites. The changes were adopted without public discussion and supplement the legislation that has already left little space for freedom of speech. Starting in 2010, customers at Internet cafes were required to present passports and register. In turn, Internet providers had to collect customer information and install search and surveillance systems. Websites catering to Belarusians had to be hosted exclusively on domestic servers. While seeking to rein in independent media, the state is stepping up its own online presence. Minsk is about to launch an online media portal aggregating information from all governmental media on the Internet. 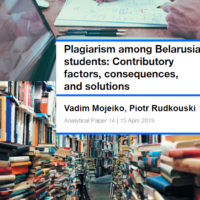 The portal is supposed to serve as a “source for all professional information” about Belarus, according to Deputy Information Minister Vladimir Martusevich. Unsurprisingly, independent media outlets were not invited to join. The new focus on Internet censorship is not distracting the Belarusian authorities from their harassment of print media. On 23 January, Belarus’s Supreme Court ended the proceedings in the case of Narodnaya Volya against the Ministry of Information. Narodnaya Volya, an independent newspaper with a circulation of 55,000, lost its appeal against the Ministry’s warning that it was spreading false information. On 3 October 2014, Narodnaya Volya received a warning for the column “Chained,” written by senior editor Svetlana Kalinkina. Kalinkina wrote that Belarus would be unable to leave the Eurasian Economic Union (EEU) upon ratifying the agreement, citing Article 13 of the Union Treaty that stipulates that withdrawal decisions are made by "consensus minus the vote of the Member State" seeking to leave. “Once you sign up – it's forever,” she concluded, thus drawing the ire of the Ministry of Information. The Ministry pointed to conflicting article 118 of the ratification agreement. As this was already Narodnaya Volya's second warning, the Ministry of Information can exercise its “legal” right to shut down the paper. At President Aleksandr Lukashenka's 29 January meeting with the press, the newspaper's editor-in-chief, Iosif Seredich, complained directly to the President about the harassment his newspaper had suffered at the hands of the Ministry of Information. Lukashenka said he would look into the matter and went as far as to promise to meet with Seredich personally. Were the “public reprimand” to take place, it would affect kuku.org, which reprinted some of the most controversial images, and Vitebskiy Kurier, which published some of Charlie Hebdo’s earlier caricatures. What is more, three participants of the solidarity action with Charlie Hebdo in front of the French embassy in Minsk on 11 January were charged with participating in an “unsanctioned mass action.” Interestingly, when asked about the charges by BBC journalist Tatsiana Melnichyk at the 29 January press conference, Lukashenka said he did not consider a four-people action problematic and promised to look into the matter. Three days later, the court proceedings for the former editor of the satirical newspaper Novinki Pavel Konovalchik, the leader of the United Civic Party Anatoly Lebedko, and the deputy of the Green party Dmitry Kuchuk were cancelled. Such an unexpected denouement suggests that the president has decided to play good cop, leaving the bad cop role to the Ministry of Information. Lukashenka's ostensible concern about Narodnaya Volya at the same press conference confirms this impression. Media outlets that reprint controversial images in Belarus have been prosecuted before. In 2006, the independent newspaper Zgoda published Jullands Posten’s cartoons of Muhammed. One of its editors, Alexander Zdzvizhkou, was sentenced to three years in prison "for “inciting racial, national or religious hatred" but released after a month. The intensification of media control can be seen as Belarus's preparation for the presidential election on 15 November. A contributing factor is the poor state of the Belarusian economy, which may follow that of Russia into a recession in 2015. Real wages are declining and the ruble has plummeted. As soon as the government slapped a 30% tax on foreign currency purchases in December, several non-governmental informational resources were blocked. It is precisely such ad hoc solutions to economic turbulence that the amendments to the media law facilitate. Yet today it is Russian state media, which propagates the idea of Belarus's belonging in the Russian world, that presents a more immediate challenge to Lukashenka's rule. Restricting Belarusian independent media in the current geopolitical circumstances may thus inadvertently strengthen the increasingly aggressive Russian influence.